← Who Would have thought? They really aren’t all like that. 1. Then why do black people throw them away so cheaply? What do you see? I see an armed and dangerous man. I see a man who is capable and willing to cause the death of another human being (whose color we don’t see in this picture). I see 7 other people who are watching him do it and not one of them is trying to talk him out of it. They are accomplices. Accomplices to attempted murder. unless that rock in his hand is being thrown through an old tire hanging from a tree branch, what we really see going on here is an attempted murder. The murder of a stranger. A murder that was not done for revenge, for personal gain, or for self defense. This murder was going to happen for no other reason than the amusement of the murderer and his friends. That makes him a psychopath too. That means that even if he didn’t murder anyone THIS TIME, he is too dangerous to be permitted to live. 2. If Black lives matter, why are all these black lives putting their lives into a situation where lethal levels of self defense against them are the morally responsible act? If that “kid” with the rock takes a 9mm slug in his face, and the rest of the magazine finds it’s way into 5 out of 6 of his friends, they only got what was coming to them. They did it. They did it because satisfying their own boredom was more valuable to them than their lives. 3. If black lives matter, Why don’t the lives of black police men matter? 4. If black lives matter, what, dear black lives, are you going to do with your life this year to demonstrate that at least your own life matters to you? Learn a trade? Open a business? Serve your community in a church or club? Parent your children? Or by this time next year are you going to be sitting in your mom’s house, smoking a blunt, and planning to go through her purse again when she isn’t looking? I know. That’s all “white” stuff and I should stop oppressing you with my preconcieved white notions of what normal looks like. If you want me to believe your lives matters, show me in the way you treat your life and the lives of others. Otherwise, STFU. This entry was posted in Crime, Police, Politics, Race. Bookmark the permalink. When I see that particular photo, I don’t see it the same way you do at all. It’s obviously a YOUNG man, possibly even a teenager! Men of that age are notorious for risky, often stupid behavior. They get in fights, have more traffic accidents, engage in more binge drinking and drug use – and they overwhelmingly commit most crimes. The two others watching on the right side (viewer’s right) of the photo are also young men, and are looking the same way as the kid with the rock, therefore everything from the previous paragraph applies. But the other four onlookers don’t appear to be looking in exactly the same direction. We don’t have enough information from outside the frame. There are sirens, shouts, alarms and other objects being thrown. We can’t see or hear that stuff, so we don’t know how it affects those in the picture. Are people whose focus is (or may be) on other parts of the chaos still “accomplices” ? Which ones are residents of the neighborhood, and which are gang members etc. from elsewhere? You may not be aware there were 10,000 peaceful protesters out there a couple of hours before the violence erupted, and the MSM focused instead on the looters and criminals, a very small sample by comparison. So much for saying “the camera doesn’t lie”. What you choose to cover or to ignore builds a news narrative. That doesn’t make the TV version correct or true. Since I don’t interpret the photo the same way you do, I can’t follow your logic down the same paths either. Sorry. I’ll STFU now. Thanks for commenting. I admit that I cannot possibly know with certainty the events pictured there. They may be at a sunday BBQ skipping rocks accross the pond and the pretty girl had to give a kiss on the cheek to the winner. No doubt that the picture alone would not be enough evidence to convict them of accessory or accomplice and it would be unfair for me to leap to the conclusion that they are all taking turns tossing rocks. The firm conclusion about the rock thrower though is pretty solid. If he is throwing that rock in the direction of another human being, then he is using force sufficient to kill that person and is presenting a deadly threat. If he is only throwing it at a car and hits a guy in the head he might get off on negligent manslaughter. For anyone in the position of self defense, the age of the rock thrower is not relevant. I agree his brain is not fully developed yet. That does not excuse him legally or morally. I was once young too and did stupid things. But I never intentionally threw rocks at total strangers, bashed in windows, or looted a drug store. 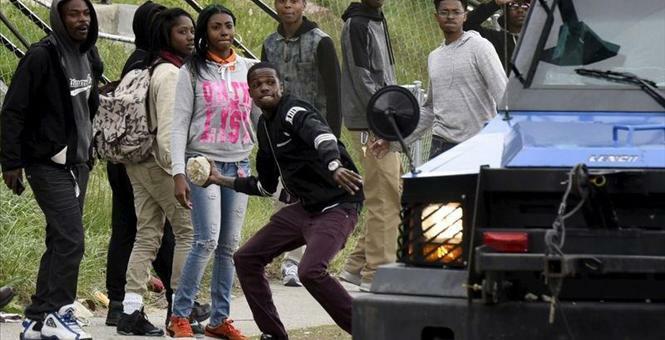 It is just a shame that this child did not have parents teach him that throwing rocks is bad. Without the rick thrower, this is just another after school picture of friends chatting about the prom. I have to disagree with Mike: just because the aggressor is below a certain age, does not make the behavior okay. Assuming this is what it appears- a minimum of vandalism and a maximum of murder- the age or even mental state of the perpetrator are not relevant… especially to the hypothetical victim who may pay with loss of life. Should the victim be armed, and trained well enough to hit what they shoot at, this might result in a dead kid, maybe more. AND THAT IS AS IT SHOULD BE. Victims have an inherent right of self defense, whatever the local laws, major media, or race baiters may say. It is better to be judged by 12 than carried by 6, as they say, and the worst case is the victim loses a child because of the thoughtless, malicious actions of a bored societal parasite. Yes, I made an assumption here. Like the liberals say, just because it might not be true in THIS case, does not mean we do not have a crisis: this demonstrates the larger problem. i never condoned the bad behavior, nor excused it. I merely pointed out some of the ways one can misinterpret a single, photographic image, and tied the aggressors action to age and gender. Throwing rocks at people (or stuff) isn’t okay, but if we are going to be making assumptions about danger and behavior based on any kind of “profile” it ought to be on age and gender – because it’s usually young men that are the bad actors in these situations. I think the larger problem (not the only problem) is that in some towns and cities, residents do not perceive police as being around to protect or serve them. They see cops as a paid force to protect the interests of corporations and groups that shut them out of legal work, and fear that “shoot to kill” is the first option in any situation, including minor infractions involving unarmed people. As far as I can see, that’s what causes unrest in general.